We often think digestion starts in the mouth, but actually it starts in the brain. Knowing this can help you understand how to improve your own digestion! You know when you think of something sour and you start to get that sour taste in your mouth and salivate a little bit? That’s an example of your brain sending out signals to your body to get ready for food! When we see, smell, taste, and think about our food while we’re eating it, our brain sends signals to the rest of our body, saying, “Get ready! Food is coming!” The stomach starts making its digestive juices like stomach acid and enzymes. The act of chewing our food also tells our body that food is coming, and signals to make more digestive juices. But what happens if we don’t give our body enough time to send those signals? Well, our stomach acid might not be high enough. Yep, you heard me right – high ENOUGH! When stomach acid is too low, food can just sit there, not being digested, and it starts to expand and push up back through the esophagus. That’s why reflux and GERD happen! Stomach acid also breaks down our proteins into amino acids (little building blocks that make up hormones, enzymes and neurotransmitters) and also kills “bad guys” – bad bacteria and parasites – before they can make it into our system. If we don’t have enough stomach acid, we can’t break down our proteins very well, and we can get overgrowth of bad bacteria in our guts. When it comes to any digestive issues, we start north to south. We have to look “upstream” to fix things “downstream”. And the furthest upstream we can go, as we learned, is the brain! One of the biggest things you can do to help improve your digestion is to eat mindfully. 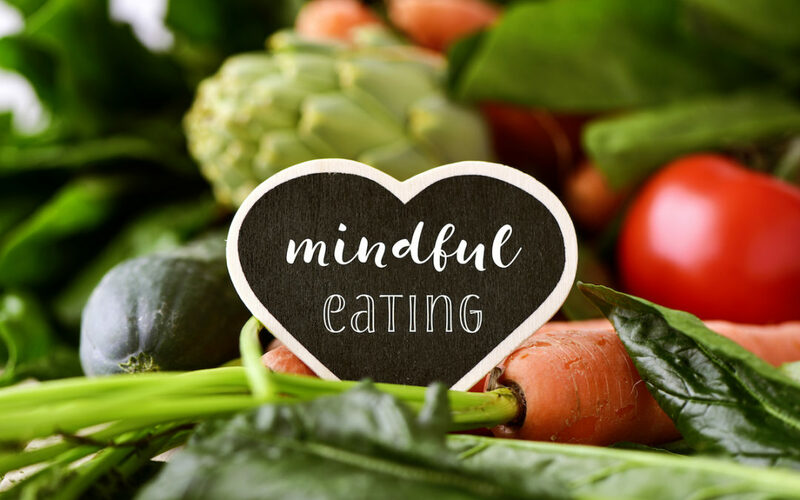 Eating mindfully is basically giving your brain enough time to send those signals to get digestive juices flowing. Also, it makes eating, way, WAY more enjoyable and helps contribute to our feeling of fullness and staying satiated for long after the meal! Sit down at a table when you eat, rather than standing up or eating at your desk at work. Take a few deep breaths to get your body in a relaxed state. If you say grace, now is a great time to do this. Turn off the TV and put your phone away. These things are distractions from the food you’re eating. Pay attention to your food before you even start eating. How does it look? What does it smell like? Take small bites with your fork. Using a fork and knife together will help rather than “shoveling” with a fork. When you do take a bite, pay attention to these sensations, too! Is your food cold or warm? How does it taste? Is it sweet, bitter, salty or sour? How is the texture? Crispy, crunchy, soft, creamy? Enjoy it! Chew, chew, chew, chew, chew! The more you chew, which is the mechanical breakdown of food, the less your stomach acid has to do, which is the chemical breakdown of food. Your food should be liquid in your mouth before you swallow it. Set your fork and knife down in between bites. Eat with a friend or family member and have conversation while you’re eating to slow down how quickly you’re eating. Sip water, but not too much. A big glass of water will dilute your stomach acid. It’s better to continually sip water between meals, but not during meals.